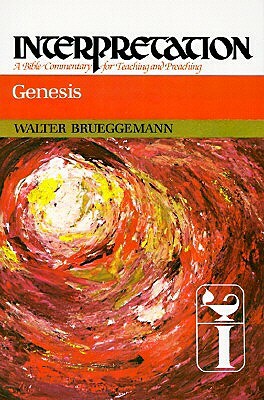 You may think I’m crazy, but I just finished reading Walter Brueggemann’s Genesis commentary from cover to cover. It has been a marvelous journey that I wouldn’t trade for anything, and my dog-eared copy is worse for the wear. I’ve underlined, drawn circles, filled the margins with my comments, folded down corners, and added lots of little colored post-it tags to take me back to places I want to read again. I know most people don’t read commentaries straight through. This was only the second time I’ve picked up a commentary that I couldn’t put down. The other page-turner was Robert Hubbard’s commentary on Ruth. Trust me, if you ever study or lead a Bible study on either of these Old Testament books, you’ll want Brueggemann or Hubbard along as mentors. The longer I read Brueggemann on Genesis, the more I dreaded getting to the last page. Now that I’m here, I’m just sad that Genesis only has 50 chapters and that Brueggemann has stopped talking. But for 50 gloriously riveting chapters of Genesis, Brueggemann has taken me on a faith-nurturing, eye-opening journey I won’t forget. He shines the spotlight on the grounding truth of God as Creator who both calls creation into existence and then calls human beings to walk with him, believe him, and be the agents who do his work in the world. God gives them promises and dreams that seem utterly lost and impossible at times, yet are more potent and sure than every force or plan that comes up against them, more than even the great Egyptian empire. God’s people find themselves holding fast to his word from within the worst calamities, the deepest disappointments, and the wreckage that they make of their own stories. Faith can sink her teeth into this kind of teaching. What Brueggemann said about the death of Jacob was especially poignant for me, especially in the aftermath of my father’s death. Somehow, talk of what heaven is like and trying to envision what might be happening there right now, has been powerless to comfort me. I actually did some speculating of my own before my dad got sick when I told him I find it hard to imagine arriving in heaven to a welcoming committee of angels and harps. I suspect it will be much more rowdy—like a 9th inning walk off victory celebration. My dad was a baseball fan, so he liked the thought of that. What Brueggemann wrote about Jacob’s death embraced reality and matched up with how things actually looks when you lose a loved one. His words proved especially timely for me and put my grieving on solid ground. Jacob dies in Egypt. The promises are yet future. But his faith in God and in God’s promises remains firm. That is apparent in the instructions he gives to Joseph not to bury him in Egypt, but to take his body back to the land, back to the cave where Abraham, Sarah, Isaac, Rebekah, and Leah are buried. Jacob doesn’t see the promise fulfilled. His life, like my dad’s, doesn’t end with a period but with a comma; not with a completed to-do list or with a checked off prayer list, but with lots of unfinished business and unanswered prayers, for there is more to the story. God’s promises stand firm, are still working, and will be fulfilled. It is the story of the promise that gives shape to the dying. There is nothing here of any life after death. Jacob goes not to heaven, but to Hebron. Going to Hebron at death suggests an important and distinctive attitude toward death. Jacob continues to hope in his death. But his hope is not that immorality is to be remembered by his children, one often held by Jews. Nor is his hope one that is often held by Christians in a stereotyped “life after death.” Rather, Jacob does his dying as he does his living, in terms of a promise that is not doubted. And that is enough, even though he does not know the form of the fulfillment (48:3; cf. Heb. 11:17-22). The fulfillments of well-being and land do not depend on historical indications of success, upon survival of specific human agents, nor upon the political capacity to capture. They depend only on the faithfulness of God. And that is guaranteed by nothing other than the word of the trusted promise-maker. It is that and only that which gives peace and well-being to Jacob in death. There is certitude that the promise is alive and at work. It is dependent upon and limited to no human or historical agent, because it is of God himself. . . . [Jacob’s] heirs are to trust that promise. The burial is to anticipate it. Fulfillments are not evident here, but they are fervently hoped for. The affirmation of the text is unmistakable. This man who has been so deeply in conflict all his life can die appropriately. All his conflicts have been in the presence of the promise-keeper. His is a troubled faith, but it is a robust faith. The listening community can learn from this old man about living and about dying. How exciting! Thank you for sharing this, Carolyn.